EIGHT years ago, a joint parliamentary committee (JPC) checking pesticide residues in beverages stumbled upon a widespread mess in pesticide regulations. The presence of pesticides in soft drinks had already caused a stir by then. Under media scrutiny, the committee quickly recommended complete overhaul of the regulations to make sure no unregistered pesticide reached the farmer without a prescribed residue limit and waiting period between application and harvest (see ‘How joint parliamentary committee was formed’). Ministries concerned promptly accepted the recommendations. Cut to the present. The Central agency responsible for registering pesticides continues to do so without setting the maximum residue limit (MRL), the legal limit of pesticide residue in food based on good agricultural practices. And the extension service rarely reaches the farmer with the advice on the proper use of pesticides. “I use whatever the dealer recommends,” says a wheat farmer in Bhopal, requesting not to be named. “Who else can I consult?” Dealers are aware of the recommendations but choose to ignore them to make profit. In 2003, Delhi NGO Centre for Science and Environment (CSE) conducted a series of experiments on bottled water and soft drinks. It found high amounts of pesticides. The companies under the scanner declared their products were safe and so did the government. After much debate, a joint parliamentary committee (JPC) was formed in 2004 to verify if the results found by CSE were correct. After enquiry, JPC found not only that the results were correct, but also that the system of pesticide regulations is in a mess. It recommended a complete overhaul of food safety regulations in the country (see ‘Pesticide residues in bottled water’, Down To Earth, February 1-15, 2003). A marketing executive at one of the leading pesticide companies blames agriculture universities responsible for dispensing advice to farmers. “The state universities are slow. They do not change their recommendations as per the availability of new pesticides, so we have to do it.” Experts agree. “The universities are not thorough with their research, so dealers take advantage of this,” says G V Ramanjaneyulu, agricultural scientist and activist with Hyderabad NGO Centre for Sustainable Agriculture. Of the 234 pesticides registered by the Central Insecticides Board and Registered Committee (CIBRC), 59 do not have set MRLs, shows a study on the state of pesticide regulations in India done by Delhi NGO Centre for Science and Environment (CSE). In fact, none of the JPC recommendations was effectively implemented, the study found. Besides asking for discontinuing the practice of registering pesticides without setting their MRLs, the JPC recommendations included reviewing MRLs periodically and prescribing waiting periods for pesticides (see ‘Defining safety’, Down To Earth, December 31, 2003). The CSE study also showed that MRLs for registered pesticides are incomplete and have not been reviewed on time. Globally, MRLs are reviewed periodically to incorporate changes in dietary pattern and agricultural practices (see ‘How to establish MRLs for pesticides). On whether the set MRLs are safe for human consumption, CSE found that the theoretical maximum daily intake (TMDI)—estimate of how much pesticide we ingest—exceeds the acceptable daily intake (ADI). 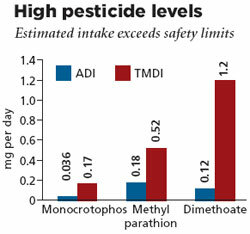 ADI is the amount of a pesticide that can be ingested without harming health (see graph). “MRLs can be corrected only by following good agricultural practices,” says A K Dikshit, member of the Food Safety and Standards Authority of India’s (FSSAI)’s scientific committee on sampling and analysis. “We need to focus on what, when and how much to use,” he adds. FSSAI was formed in 2006 under the recommendation of JPC to be a one-stop shop for pesticide regulations in the country. CSE studied 10 pesticides for their waiting periods. It found that in all the cases the periods were not prescribed for all crop-pest combinations. Another major finding of the study was that the recommendations for pesticide use by state agricultural universities are in disarray. CIBRC registers pesticides for different combinations of crops and their corresponding insects, diseases or weeds. The universities are supposed to ensure that they recommend a pesticide only for the crops it is registered for. But most universities disregard CIBRC’s registration. “We conduct our own field trials and then make recommendations,” says a senior professor of a leading state agricultural university who did not want to be named. But Ramanjaneyulu says universities do not conduct proper field trials as they claim. Despite repeated calls to the agricultural ministry, no one responded. 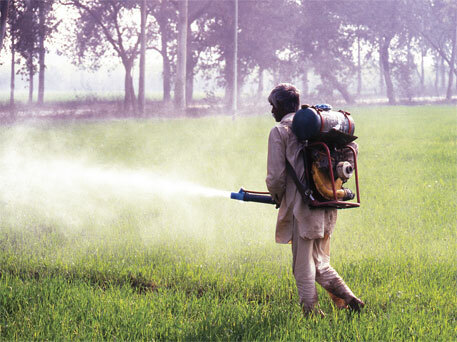 Of the 234 pesticides registered under the Central Insecticides Board and Registered Committee (CIBRC), 59 do not have set maximum residue limits (MRLs). The joint parliamentary committee (JPC) had recommended discontinuing the practice of registering pesticides without setting their MRLs. Analysis shows the recommendation has been largely ignored. Pesticides have been registered with incomplete MRLs. Tebuconazole, a pesticide registered for chilli, rice and groundnut, has MRL only for wheat. MRLs set do not cover all the crops a pesticide is registered for and have not been reviewed for their compliance with acceptable daily intake (ADI). Quinalphos, a pesticide registered for 32 crops, has MRLs set for only four. Methyl parathion has been registered for seven crops; MRLs are set for two groups, fruits and vegetables, for which the pesticide is not registered. The theoretical maximum daily intake for pesticide monocrotophos, which has been banned in many countries, is four times its ADI for adults and 16 times for children. For wheat, state agricultural universities recommend 11 pesticides in Punjab, five in Haryana, two in Uttar Pradesh and nine in Madhya Pradesh that are not registered for the crop by CIBRC. For all other crops, the trend is similar. Professors and scientists in five universities accepted that the practice is wrong and needs to be corrected. In most of the cases farmers follow recommendations of dealers. Consequently, they use pesticides not suitable or registered for their crops. Farmers and activists in different states accepted that dealers have maximum influence on what chemicals farmers are using. Waiting periods recommended for many pesticides by CIBRC are incomplete. Phorate, a widely used insecticide, has been recommended for 49 different crop-insect combinations but its waiting period has not been prescribed. Under RTI Act, information was sought regarding pesticide residue analysis by state governments. Almost all the states informed they are not analyzing pesticide residues. In Kerala, pesticide residue analysis is done by TLC method. I am waiting the report from Central Food laboratories. Copy of all these replies will be sent to CSE for further action in the matter. Thanks a lot sir. Will look forward to the documents.